>One thing crossed off of my sewing list! Hurrah! It seems that all things Nautical are the order of the day for this Spring and Summer. With the weather starting to get warmer in some parts of the country, I can sense that other seamstresses are getting inspired as well! 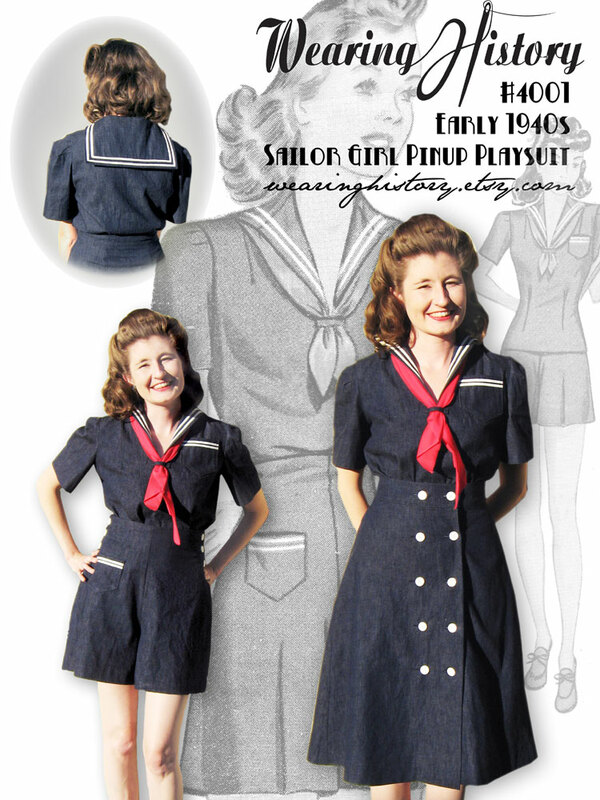 In preparation for our show next month I finally made up #4001- the Sailor Girl Pinup Playsuit pattern. I had made this up for myself previously but with moderation to the original design, so a new set true to pattern specs was in order! Funny, in the last month or so I’ve been sewing this up, Casey has been sewing this, and a lovely gal in Vegas is making it for Viva. With the nice warm weather today I finished off my set, enjoyed some Jack Johnson beachy music, and enjoyed the promise of sunny summer days in the future! Ta da! The only modifications to this one is in size- although it’s me showing it right now my cousin is wearing this for me in the show, so it’s closer to her size than mine (though it’s hard to tell cause we’re so close!). I love the raised waistline of the shorts, and the high waistband of the skirt. I think it would be pretty easy to extend the skirt and make it with long sleeves (since they’re included) to do a WWI style nautical inspired outfit. Wouldn’t that be fun? I am loving the classic and Nautical inspiration shown in Chanel’s Resort 2010 Collection. Anthropolgie has a charming By the Sea inspired set. I’m especially partial to the Brighton Beach Romper. If you’re looking for vintage nautical patterns, My Sweetie Pie on Etsy has a wonderful pattern for a 50s sailor sportswear set. I’ve got a super cute 50s pencil skirt pattern up in my store right now, too, that I can see shortened to knee length in denim with big white buttons. This vintage fabric on Etsy is dying to be made into something fabulous! And if you’re looking for ready to wear vintage style fashions Revamp Vintage has some charming sailor seperates! My Baby Jo has a 30s inspired ready to wear trousers and top set. Stop Staring has a couple cute nautical style things as well- 50s inspired sailor dress and playsuit. Hope everyone’s having a fabulous week! >wow… that is lovely. I definatly wouldnt mind if one of those ended up in my wardrobe! :) Will seriously have to look into some sewing lessons, ASAP. >So cute, Lauren you will be adding patterns to my ever growing stash !! >I love it! You are too cute. >This is so cute! Off to find out if it is in my size or something close enough that I could adapt so that it could be my first purchase from you!